Jonathan R. Crow and Michael A. Pershing, Caterpillar, Inc. This paper discusses a unique method of producing a sample for grinder burn etch testing. The method of producing the sample is described, and methods of quality control using the standard are proposed. Fig. 1 – Series of tanks for acid etching in a gear manufacturing facility. Surface temper etch inspection (“acid etch” testing) for thermal damage as a result of hard finishing (typically, grinding) operations is the most prevalent inspection method in gear manufacturing. The acid etch method relies on contrast in color, resulting from nitric acid severity of attack on thermally affected areas versus those areas that are not thermally affected. There are known issues with maintaining proper nitric acid baths, HCl baths, wash baths, and rinse baths. Assurance that an acid etch system and method is working correctly requires a standard sample. This paper discusses a unique method of producing a sample that has a very consistent amount of thermal damage. Multiple degrees of burn are applied to the sample to ensure that the etch inspection can detect all levels of potential burn on the piece parts. The sample can then be reliably used to test an acid etch system and method to ensure the proper amount of contrast for threshold levels of thermal damage. The developed sample, with standardized burns, may be processed through the etch tanks at frequent intervals (or even simultaneously with piece parts) to ensure the etch system is able to detect any burn that may be present on the actual piece parts. The method of producing the sample is described, and methods of quality control using the standard are proposed. Hardened gears subsequently hard finished (typically via hard grinding) can be subjected to thermal damage known as “grinder burn.” This undesirable thermal damage occurs if hard grinding variables are not carefully controlled. 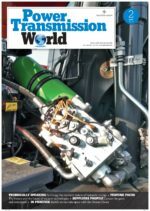 The thermal damage resulting from grinder burn negatively affects near-surface metallurgical properties and can result in reduced gear life or even premature failures. The harmful effects depend on the degree of thermal damage present and can include reduced hardness, increased hardness, harmful change in residual stress state, and even cracking in more severe cases. Detection of this burn is critical in any quality control plan for hard ground gears. Although various methods are utilized to detect grinding burn, many gear manufacturers continue to utilize one of several varieties of surface temper etch inspection methods (herein called “acid etching”). Acid etching has been utilized for many years, with successful implementation in many industries that utilize hard grinding. Other NDE methods are also utilized, such as Barkhausen noise, which have been beneficial but also difficult to implement economically and without confident correlation of results. For this reason, acid etching is the most common method. Fig. 2 – Example of burned gear after going through the acid etch series of tanks. Dark areas show “temper-back,” with some visible cracking. Several international standards exist for grind burn acid etching [1,2]. Exact processes vary, but all generally use some combination of pre-cleaners, etching acids, rinses, and rust preventive steps (Fig. 1) to create a detectable visual contrast on any burned areas of the ground surface (Fig. 2). Regardless of the method used, the detection of damage is visual – and therefore extremely dependent on careful control of the etching processing variables to achieve an acceptable result. After burned parts are acid etched, differing degrees of grinder burn are visually discernable and differ in appearance and therefore simultaneously provide guidance on both the presence and severity of burn. In order to assure that the acid etching procedure and system is working well, a standardization sample is desired to ensure adequate controls over all of the variables encountered in acid etching. “Grinder Burn” is a blanket term that encompasses varying degrees of thermal damage, and etching is used to indicate both the presence and severity of any burn present. After etching, an undamaged part will be a uniform light gray color. Areas heated enough to cause excessive tempering will etch darker than this uniform light gray and will appear between a darker shade of gray or even black, depending on severity of temperature exposure. This type of damage is commonly called “overtempering,” “temper-back,” or simply “tempering.” The most severe type of burn occurs when the thermal exposure due to grinding damage exceeds the material’s austenitizing temperature, and is commonly called “re-hardening.” Re-hardened areas etch white against the gray background and are typically surrounded by an intermediate temperature exposure area, etching black or gray (temper-back). A burned gear could therefore have varying mixtures of black, dark gray, light gray, and even white areas after etching, depending on the severity of burn present. For visual detection, any burn must exhibit sufficient contrast against this palette of a uniform gray. For any etching process, developing this contrast between damaged and undamaged areas is of paramount importance. There are many variables to control in an acid etch process in order to properly detect grinder burn. Typically, control of the acid etching process is accomplished through careful control over all measureable process inputs – immersion time, bath temperatures, bath concentrations, and many others. Loss of control of any of these variables can create false-positive or false-negative burn detections depending on the nature of the error, causing unnecessary rework, scrap, or even customer quality excursions. Setting of control limits for each of these variables is typically based on experience and past practice, which creates the highest possible visual contrast, balanced with the minimized part damage and material removal from the parts. Establishing control ranges for these various process inputs is difficult. In fact, limits may even be established that are more demanding than the process requires, simply in an effort to ensure a semblance of process control. Further, there are several important variables that are much more difficult to quantify (part cleanliness and bath cleanliness, for example) that are not easily measured or quantified in a production environment. The sample described herein bypasses these limitations of conventional process controls and presents a known burn to the process to ultimately test the level of detectability produced by the entire etching process. Multiple standards (ISO 14014 and AMS 2649) [1,2] refer to the need of the creation of pre-burned samples to aid in verification of etch process performance, but creation of these samples is out of scope of these documents, therefore they lack any detail about how to create them. While creating deliberate grind burn on a test sample is certainly possible with a grinding wheel, the repeatability of any type of such a process is likely to be low. Replication of a consistent level of thermal damage is desirable for sample distribution among various facilities in an organization, for example. Creating varying levels of thermal damage on a prepared test sample is possible in a repeatable fashion and is the focus of this paper. Fig. 3 – Drawing showing dimensions of the round plate that is carburized, hardened, and lightly ground and then laser heat treated. Ideally, a single test sample could be created that would show different levels of tempering or thermal effect. In order to emulate the thermal effects of grinding damage, a laser was used to create a specimen with exact and differing levels of tempering or heat throughout one specimen. Laser heat treatment of sample plates, consisting of similar material and heat treatment as the subject parts, is the proposed solution to the desire for a single standard test piece. Laser heat treating is an attractive option because of its ability to create multiple levels of thermal damage on the same part with the same process in a single part setup. Additionally, the heat input is controllable over a range of heat inputs. Using this method, a single sample may be thermally exposed over a range of temperatures, emulating varying levels of grinder burn within the same part. Of particular usefulness, this process may be repeated on multiple samples, creating multiple ‘standardization’ samples that may be used in differing acid etching processes. Such samples could even be run at the same time as the parts being analyzed, providing a record of acceptable etching performance. 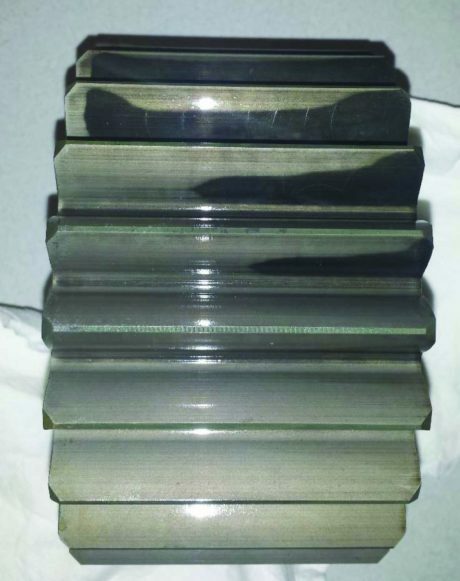 Since the sample was developed in conjunction with carburized and hardened gear manufacturing, the standardization sample was similarly carburized and hardened with a similar material. 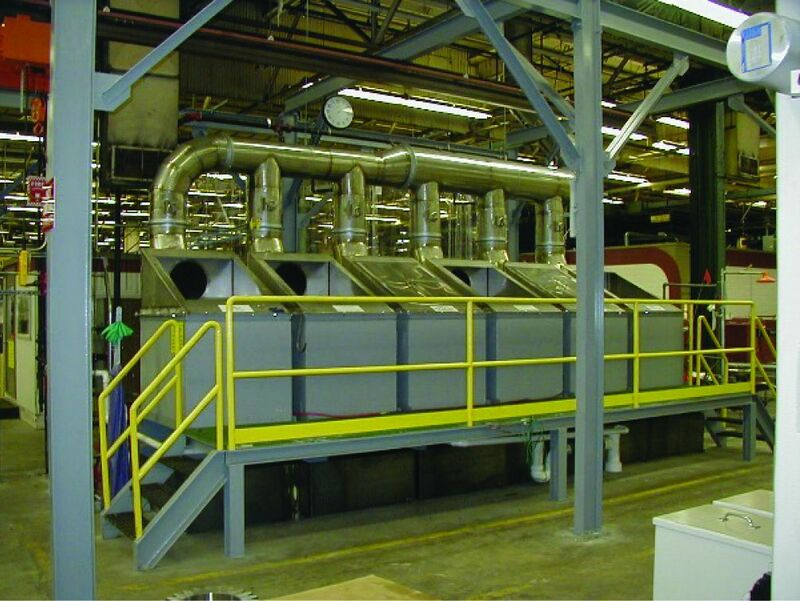 The same standardization approach would work with gears hardened by various other means, provided the test samples were manufactured from a similar material and heat treat combination as the audited parts. Fig. 4 – Non-martensitic transformation products at the surface of the plate after carburize and harden. Removal by grinding is necessary to keep steady temper-back color effects. The grinding must be done carefully so there is no thermal damage. Figure 3 is a simple drawing of the proposed sample. 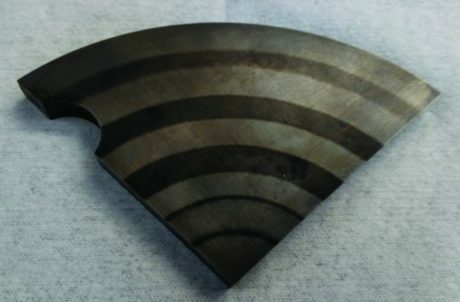 This plate is first carburized and hardened to an effective case of approximately 3 mm and a good surface carbon plateau of 0.8–0.9%C. The plates are then very carefully surface ground to remove approximately 100 microns of material. 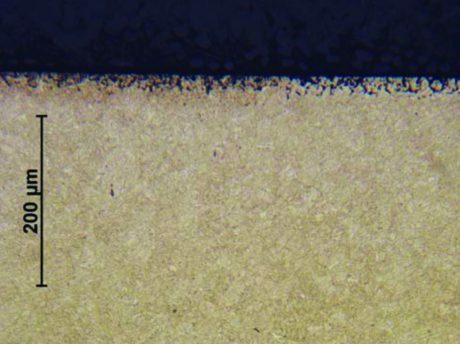 This minimum stock removal is important to ensure removal of the shallow layer of non-martensitic transformation products (NMTP) from the carburized case that would otherwise interfere with accurate visual inspection after etching (see Fig. 4). During grinding, parts were repeatedly etched to ensure no grinding burn was occurring and the surface grind process was in control. Parts were not etched after the final grinding pass to ensure a consistent surface finish and reflectance necessary for subsequent laser heat treating. Laser heat treating was then utilized to create at least three different degrees of burn damage – complete re-hardening, heavy tempering, and light tempering, with intermediate levels applied as space allowed on the surface of the sample (Fig. 5). Once the cycle was established, it was easily replicated to create many identical samples. Both sides of a given plate may be laser heat treated, providing two surfaces for inspection if desired. There are different ways to make the samples, in terms of the laser heat treat pattern. The samples may be sectioned into smaller pieces as desired. Various lasers and settings could be utilized to produce the sample. For this work, a 4000 W direct diode laser was utilized (880 nm wavelength, continuous wave). Once a consistent set of samples has been created, it is ready to be utilized as a part of the quality control around the acid etch process. A sample can be processed in a given acid tank as an audit of etching performance. The sample may be run periodically (i.e., 1X/shift, 1X/4 hours, etc.) or even run side-by-side with especially critical piece parts. Samples may also be cleaned and re-used multiple times. Re-use frequency is dependent on etch cycle specifics (concentration, immersion time), but re-use of samples up to 20 times has been observed. Fig. 5 – The standard sample as it appears after a good acid etch. While cleaning via abrasive pad between etching runs was used for these studies, any cleaning method that minimizes stock removal and returns the part to a shiny, pre-etching appearance is acceptable. 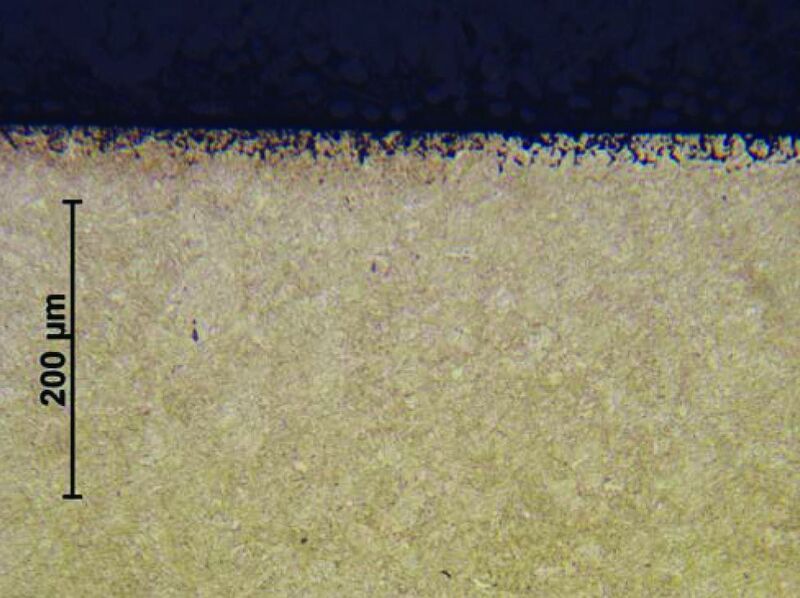 After too many etching cycles, the more aggressive acid attack in the burned areas eventually creates observable pitting on the surface of the sample, at which point it should be discarded and replaced. Pictures may also be kept of etching performance of the test sample from each etching cycle as an additional record of process performance. Both Type I errors (α-Risk, Producer Risk) and Type II errors (β-risk, Consumer Risk) can occur with grind burn etching processes if variables are not closely controlled. The test samples can help to avoid either type of error but are particularly effective in avoiding Type II errors. In a scenario without use of the sample, the etch tank could be completely ineffective in detecting burn, and be unknown to the inspector. In this case, the inspector could unknowingly release burned parts to a customer. Using the described ‘standard’ samples now allows the inspector to be sure that the tank performance is adequate to detect the necessary ranges of burn severity. The samples are also particularly useful to assess potential changes to the acid etch procedure. Changes to chemical types, suppliers, or concentrations are sometimes necessary or desired, and there may be questions about the process remaining effective or equivalent to the previous procedure. These samples provide a method for judging the effectiveness and equivalence of these changes. A standard sample was created to standardize and “master” the performance of a given etch tank and process. The sample ensures that differing levels of thermal damage can be detected by using laser heat treatment to create areas of re-hardening, heavy tempering, and light tempering, all on the same sample piece. A single standard sample piece can be reused multiple times. The sample is effective for use in daily quality control or in evaluating potential acid etch procedure changes. Paper already presented at AGMA FTM 2017. Printed with permission of the copyright holder, the American Gear Manufacturers Association, 1001 N. Fairfax Street, 5th Floor, Alexandria, Virginia 22314. Statements presented in this paper are those of the Authors and may not represent the position or opinion of the AMERICAN GEAR MANUFACTURERS ASSOCIATION.